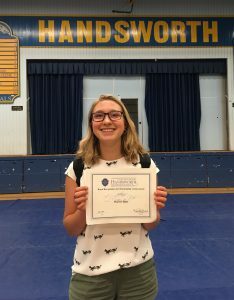 Handsworth Secondary student, Meghan Little, was recently presented with a Student Recognition Award for her efforts to bring Meatless Monday to her school. Meghan’s peers and teachers nominated her for the award and even put together a video highlighting her work. The Vancouver Humane Society (VHS) was honoured to be in attendance at the awards ceremony to celebrate Meghan’s success. VHS Program Coordinator, Emily Pickett, first met Meghan at Handsworth’s Be Aware Fair, where VHS was tabling and talking to students about our Meatless Monday program. Meghan was keen to bring the initiative to Handsworth and so she worked with VHS, the school’s Environmental Club (of which she was a member) and the food service provider to get more veg options on the menu. Handsworth’s Meatless Monday initiative was successfully launched on November 20, 2017 and Meghan and fellow Environmental Club members have been raising awareness of the benefits of going meatless and encouraging students and staff to opt for the Meatless Monday special ever since! Meghan’s leadership and dedication to protecting animal welfare, the environment and public health were instrumental in improving student access to plant-based foods at multiple North Vancouver secondary schools. Meghan’s efforts inspired students at other schools to get involved and ultimately helped contribute to the recent commitment by local food service provider, Amaga Food, to expand on Meatless Monday by transitioning 20 per cent of the regular menu to plant-based at five North Vancouver secondary schools (Handsworth, Sutherland, Argyle, Windsor and Seycove secondary), starting this fall. This means students and staff will have access to humane, healthy and sustainable plant-based options every day! This achievement would not have been possible without the help of Meghan, Handsworth’s Environmental Club and the incredibly dedicated students involved at the other participating North Vancouver secondary schools. As a grade 12 graduate, Meghan leaves behind a meaningful and inspirational legacy at Handsworth and is excited to attend the University of British Columbia in the fall, where we look forward to continuing to support her efforts to spread the “go veg” message! Learn more about Meatless Monday and donate today to help us improve access to plant-based options at more schools and institutions. You can also check out a recent feature on Meghan’s efforts in the North Shore News!